On this week’s podcast, learn how the urban farming movement is changing the food landscape for the better. Diet has a great impact on the quality of human life—hence, the expression “you are what you eat.” Our diets suffer for many reasons, including our desire to be satisfied quickly. Many of us, especially in urban areas, also struggle with finding access to fresh fruits and vegetables, the cornerstone of a healthy lifestyle. With the advent of urban agriculture initiatives, that struggle is waning, and building owners, operators, and occupants have a significant role to play in bringing the farm to the table in cities and communities around the country. On the newest episode of “Built for Health,” Dr. Michael Greger, a physician, author and professional speaker on public health issues, and Christopher Grallert, Partner, Advisor and Managing Director of Green City Growers, join host Flavia Grey for a discussion on nutrition and how the urban farming movement is changing the food landscape for the better. Listen to “Built for Health: Nutrition and Food Production” for more on the connection between nutrition and health outcomes, strategies for onsite local food production and how edible landscapes can support your environmental goals. Learn more about what our bodies need to be healthy and how buildings can help provide the means to cultivate an optimal diet. The episode is eligible for .5 CE hours on the Education @USGBC platform. Listen to the episode, and then take the quiz. After the shock of a disaster has abated, the community begins to think about restoring normalcy. Bringing back school operation is a top priority since it allows faculty and staff to get back to work and brings students back to the city. But this can take time. After Hurricane Katrina, for example, it took several months for a few schools to return to operation and almost two years before there was enough building capacity to meet the demands of the families returning to New Orleans. States have an opportunity to assist communities in their efforts to rebuild better than before. All federal disaster funds flow through states to local communities, and most local communities are unprepared because they do not manage these funding sources on a regular basis. States are well positioned to provide technical expertise to local leaders and to help manage recovery and envision what the future can hold for a community, including its school system. State governments should support efforts at the local level not only to recover from a disaster but also to ensure community resilience after future events. Based on my experience in rebuilding the school system after Hurricane Katrina, here are a few recommendations for how states can assist. 1. Help local governments develop and adopt a master plan immediately. One of the major obstacles to rebuilding in New Orleans after Hurricane Katrina was the lack of a comprehensive rebuilding plan. School reconstruction had to wait until the city’s plan could be decided, thus delaying when students could safely return to school. Many federal funding streams require the existence of a community-wide plan, developed with community input. This process can be lengthy and contentious. In New Orleans, it took two years to develop a plan for the city, then another year to develop a plan specifically for the schools, which had not had a master plan since the 1950s. Prior to Katrina, the Recovery School District of Louisiana—a statewide school district of underperforming schools established in 2003—only operated a handful of schools in New Orleans. The Orleans Parish School Board operated a portfolio of buildings that had 50 percent more capacity than enrollment. If a master plan for optimizing these facilities, including new construction and major renovations, had been in place prior to the storm, the rebuilding process could have been initiated far more swiftly, and schools could have been a powerful anchoring force for community health and recovery. 2. Establish minimum standards for greener, more resilient school buildings. A 2015 national independent poll commissioned by USGBC found that 92 percent of Americans believe that the quality of public school buildings should be improved. To do this, we need standards that align policy with contemporary expectations for healthy, green and resilient school buildings. Federal disaster funding, too, requires building standards as part of project formulation. However, many small rural and large urban districts do not have the time, resources or expertise available to evaluate or establish standards that prioritize community health and resiliency. Among other benefits, standards that include measures to enhance resilience, such as USGBC’s resilience-focused tools, can prepare buildings to serve as emergency shelters during future events. Here again, states can help by providing guidance and resources well in advance of any urgent need. 3. Provide technical assistance and advocacy. Conducting a thorough review of state procurement laws, comparing requirements outlined by the funding source with the options available to municipalities and state agencies. When barriers are discovered, states should negotiate a solution on behalf of the applicants, rather than requiring applicants to manage this on their own. Frequently convening a cross-section of applicants to identify common problems and to facilitate sharing of best practices. Creating a list of the common barriers to recovery across the portfolio of applicants. This could advance state-level policy and serve as a model for other states. 4. Assist with cash flow. Many municipalities and local subdivisions are strapped for cash, limiting their flexibility to quickly invest in critical infrastructures, such as schools, in a timely manner. States should have a process to advance or loan money, as well as one to hasten reimbursement of expenses. Since most federal disaster grants are reimbursements, states should consider a revolving loan process for eligible work, to help municipalities that don’t have the cash flow to get started. When states support municipalities in rebuilding local infrastructure, local efforts are amplified. For schools, this support is especially critical, because they serve as cornerstones of their communities. With states and municipalities working together, schools cannot just return to normalcy but can emerge more resilient than ever before. The event featured policy briefings and discussions on water, energy, air, land, transportation, and health. Feature image photo credit: Climate + Energy Project. The event featured policy briefings and topical discussions on the six subjects suggested by the WEALTH acronym: Water, Energy, Air, Land, Transportation, and Health. Participating on behalf of USGBC Central Plains were Jennifer Gunby, USGBC State and Local Advocacy Manager; Julie Peterson, USGBC Director of Community for Central Plains; and Josh Thede of Henderson Engineers, USGBC Central Plains Emerging Professionals Chair–2018, and City of Mission, Kansas–Sustainability Commission. USGBC is monitoring two particular energy efficiency bills and met with Gov. Jeff Colyer’s staff on expanding the benefits of energy efficiency and green buildings in Kansas. KS SB347—Utilities and demand-side programs: Changes how benefits of energy efficiency programs are calculated by replacing the state’s current tests with one based on the National Standard Practice Manual. KS SB 322—Utilities and the net metering act: Would revert state law to 2009 regulations that protect Kansas residential distributed generation (DG) from demand charges. This would apply only to investor-owned utilities’ residential solar customers. Aclima’s Scott Andrews talks about designing for IAQ data. This article is written by Scott Andrews, LEED AP BD+C, Director, Aclima, Inc. In this series, speakers from USGBC Northern California’s GreenerBuilder conference, held July 13, 2017, at the Zero Net Energy Center in San Leandro, share insights from their sessions. Interested in supporting GreenerBuilder 2018 as an event sponsor or exhibitor? Please contact Brenden McEneaney. USGBC’s Pacific Regional Director, Brenden McEneaney, and the President and CEO of USGBC and GBCI, Mahesh Ramanujam, kicked off GreenerBuilder 2017 with two very important concepts: First, that we must remember that green buildings are always about people, and second, that data is a natural resource in itself. Therefore, it was fitting that the first session of the morning, “Science and Practice of Measuring Human Performance in Buildings,” focused on the collection and application of environmental data to improve our buildings for people, who spend up to 90 percent of their days living, working and learning indoors. Recent research shows that there is an undeniable correlation between measurable indoor air quality (IAQ) conditions and human cognition. This unleashes an entirely new set of economic considerations in managing commercial property. With new definitions of what constitutes an optimal indoor environment, tenants are beginning to look past aesthetics to the sizeable economic gains that healthier office environments can offer. This session, which included Lane Burt (North America Lead for Buildings Alive), Simon Turner (President and CEO of Healthy Buildings), and moderator Scott Andrews (a director at Aclima), took the audience through the science to the economics and into practice. And fortunately, just as the deep relationship between IAQ and human health and wellness is becoming more widely understood, so too are our desires and abilities to empower facility managers to gather reliable, hyperlocal data to optimize building environments for health and well-being. The panel explored the question of how we will design, construct and operate buildings in five years. It was proposed that buildings might look more like a computer, with software controlling the building and adjusting to climate, health and other conditions in real time to optimize spaces for our most important resource: our people. Although the panel agreed that some version of this new era of smart buildings may soon be a reality for many properties, thanks to the democratization of data that companies like Aclima are delivering to the marketplace, it will remain an imperative to train our facility managers. After all, not all aspects of a building can be automated, and this newly available data is only as valuable as the people and systems in place to analyze and apply it. FM, along with their consultants and internal teams, represent the critical last-mile delivery service for applying data analytics to make IAQ improvements and co-optimize the indoor environment and energy performance. Distributed real-time sensor networks with parameters like CO2, VOCs, and comfort indicators such as temperature and sound levels represent the missing meter to measure how our buildings turn energy and water inputs into desired outputs. 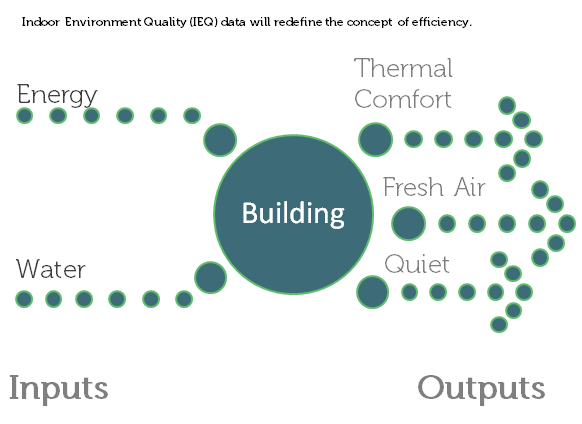 This includes a close review of building systems and potential outside factors that could impact IAQ, which can also be measured with on-site outdoor sensing equipment. There is a need to connect good intentions with measured outcomes, and new products and services are making this possible like never before. In March of 2016, USGBC Central Pennsylvania identified an opportunity to work with Habitat for Humanity of Harrisburg on a rewarding project: a duplex that was going to be given to a military veteran’s family, which had suffered from a fire. The goal of the project was to provide a low-cost and healthy home that operated sustainably to keep day-to-day costs for the family very affordable. With new roofing and windows, and a complete remodel of the interior by Habitat for Humanity volunteers, the property will soon be a beautiful home to a happy family. The space has energy-efficient windows donated by Plygem, upcycled cabinets, and countertops from the Habitat ReStore and bamboo and cork flooring donated by Calibamboo. USGBC Central Pennsylvania is looking forward to more projects in collaboration with Habitat for Humanity in the coming years. We are also glad to support other community-focused organizations that are interested in sustainability. Please email Heidi Kunka, the community’s director, or phone 202.706.0836, if you have a project in mind.